It is amazing that Canada has a Canada Goose problem. 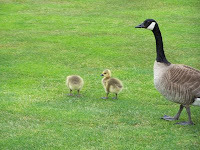 Since there are few predators, the Canada Goose population has soared. Parks, golf courses and beaches are being visited by these grand birds in record numbers and of course they leave their poop everywhere. At one of our local golf courses a dog named Chloe was sent out to keep them in the air. After two years of harassment, the Goose no longer land there. Nice work Chloe. At another course yesterday, we had to clean the goose poop of the wheels of our golf carts. We need more Chloes. The are magnificent birds. Perhaps our food shelters could start serving Sunday goose dinners. Oh so cute when they are little and fuzzy!